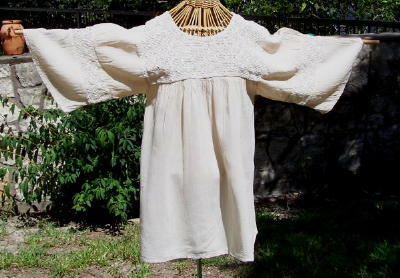 Natural soft cool Mexican organic cotton. 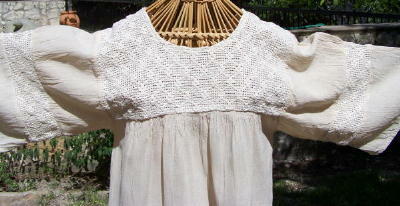 This blouse a classic peasant design, with the lace neck and the big sleeves. 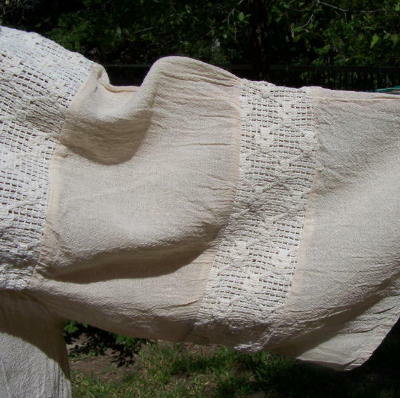 The lace work on the front and on the sleeves is prevalent in blouses worn by indigenous countryside women, who frequently put a lot of handwork on their clothing. Most of us remember this look form the 60’s. It is very soft and pretty, and terrific over jeans. This blouse is made to be big and roomy. In the last shipment the blouses arrived ONLY in natural. I do have a few white XL left. I will try to get more of these in white, but it won't be this season. The good news is that these natural blouses are longer, and are also easy to hem. TO MEASURE: Put your bra on. Measure around the entire circumference from your back including your full bust at the front of the cups. This is your TRUE bust size for Mexican clothing. Your bust size as measured above should fall within the "bust opens to" measurements below. Your blouse will fit best if your bust measures 34" - 38""
Small Natural Best fit bust under 40"
Medium Natural Best fit bust under 44"
Large Natural Best fit bust under 48"
XL Natural Best fit bust under 54"